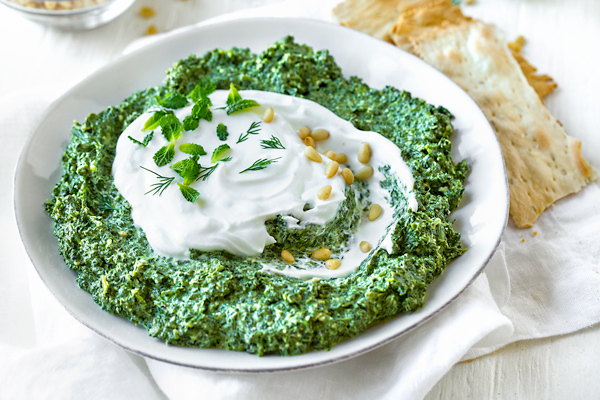 This cool, creamy spinach dip is made with Greek yogurt and flavored with fresh herbs, pine nuts, a hint of lemon, and garlic; and it’s the perfect healthy accompaniment to crisp crackers or fresh-cut veggies! I’ve always loved a creamy dip to plunge my chips, crackers or veggies into. I enjoy the simple sour cream-based dips with the savory flavor of onion, or those “perfumed” with fresh herbs such as dill or chives. The beauty of a good dip is that it doesn’t have to be super heavy and rich to be delicious, just full of flavor to make all the tasty morsels that are being served with it much tastier, and this spinach dip recipe is exactly that! 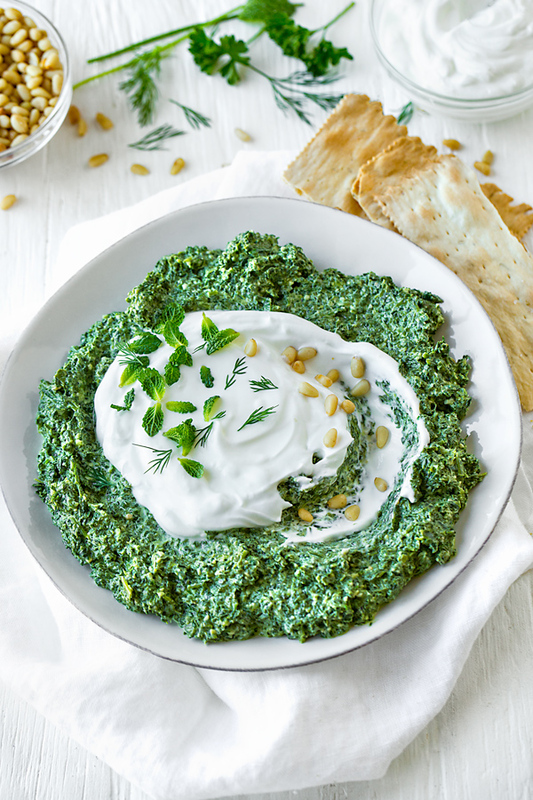 Made with thick, rich Greek-style yogurt, a hint of olive oil, some pine nuts, garlic, lemon, a combination of fresh herbs, and, of course, lots of baby spinach, this dip simply gets whirled up and chilled. It’s full of good-for-you ingredients, lots of vitamins and minerals, and bright flavors which make this dip doubly delectable! Because this particular spinach dip is a cool and healthier version, the ingredients that I use simply get added to the food processor and whirled up until smooth. The only “cooking” is a quick blanch (about 30 seconds) of the spinach leaves, and this is just to make them easier to blend and rid them of their rather “raw” flavor. The remaining ingredients simply get added to the processor in a couple of stages, and then the prepared dip is chilled for about an hour or two before it’s ready to be served. First, I blanch my baby spinach leaves in salted, boiling water for about 30 seconds, then remove them and add them to ice-water for about 1 minute; then, I drain them, squeeze the water out thoroughly, and pat them dry. To the food processor I add my toasted pine nuts and process those to break them down a bit. I then add the spinach, herbs, garlic, lemon juice and zest, and salt and pepper, and process until smooth. I then add in the yogurt and the olive oil, and process until creamy. Finally, I spoon the spinach dip into a serving bowl and allow it to chill for about an hour or two. Before serving, I add another small dollop of yogurt on top, and garnish with micro greens and/or fresh herbs, and serve with crackers, lavash crisp, or cut veggies. Baby spinach: Fresh baby spinach is great pick for this recipe. I simply blanch it, cool it and pat it dry before using. You can also use frozen and thawed spinach, just make sure to squeeze it of any excess water before using. 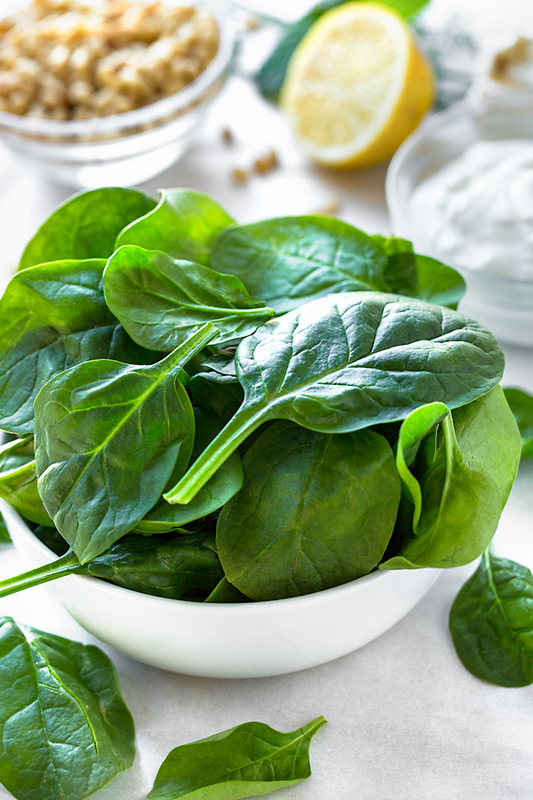 Give your spinach a squeeze: Once you blanch your spinach, cool it down in an ice bath and drain it, be sure to squeeze it very well of water; otherwise, you may end up with a slightly watery dip. Thick and creamy plain Greek yogurt: I like full-fat Greek yogurt for this, because a little bit of fat provides extra flavor; but you can use a low-fat version if you prefer. Just be sure to choose plain yogurt. Choice of herbs: I like a bit of complex flavor in this dip, so I opt for some fresh chives, parsley, dill, and a hint of mint—so tasty! But you can use your own favorite herbs, or any combination of the ones I suggested. Substitutes for pine nuts: I like the flavor that toasted pine nuts provide here, but you can also sub roasted almonds, or even roasted cashews or walnuts. Delicious accompaniments: Serve this dip as you would any cold, creamy dip, with an array of chips or crackers, or cut veggies. 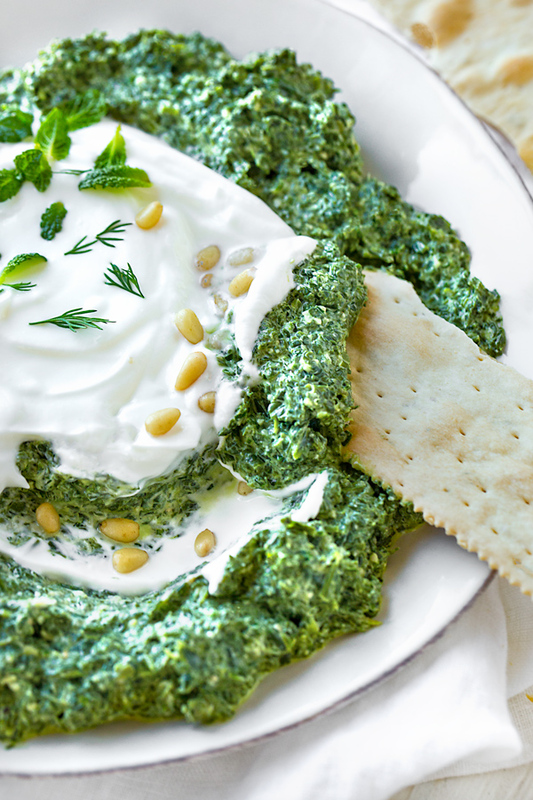 Cool and refreshing, this creamy spinach dip is made healthy with Greek yogurt and olive oil, and flavored with lemon, fresh herbs, and toasted pine nuts. -Bring a large pot of salted water to the boil, then turn off the heat; add in the spinach leaves (work in batches if necessary) pushing them down and allowing them to blanch/wilt for about 30 seconds to 1 minute, then drain. -Plunge the spinach into ice water to cool it, then drain, squeeze very thoroughly of water (important! ), and pat dry with a paper towel. -To prepare the dip, add the pine nuts to the bowl of a food processor, and process until fine. -Add in the spinach, all of the herbs, the garlic, and the lemon juice and zest, and process until smooth, scraping down the sides of the processor as needed. -Next, add in the Greek yogurt, the olive oil, and the salt and pepper, and blend until well combined and completely smooth. -Spoon the dip into a holding bowl, wrap in plastic, and chill for at least 1 – 2 hours, or more if prepping ahead. 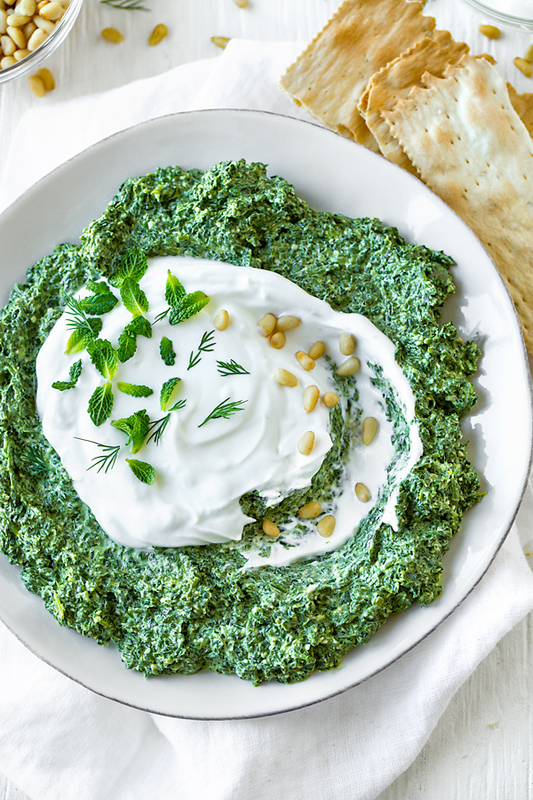 -When ready to serve, give the dip a mix with a spoon, then spoon it out into a serving bowl or large plate/platter, and top with a generous dollop of the Greek yogurt; sprinkle over some herbs or micro greens for decoration and flavor, and serve with your favorite crackers or veggies. Craving more tasty, cool dips? Check out this White Bean Dip, the Guacamole, or this Roasted Garlic Hummus!